German physician; born at Berlin Nov. 10, 1821; died there Oct. 30, 1893. After studying at the universities of Heidelberg, Halle, and Berlin (M.D. 1844), he settled in Berlin in 1845, where he practised until his death. 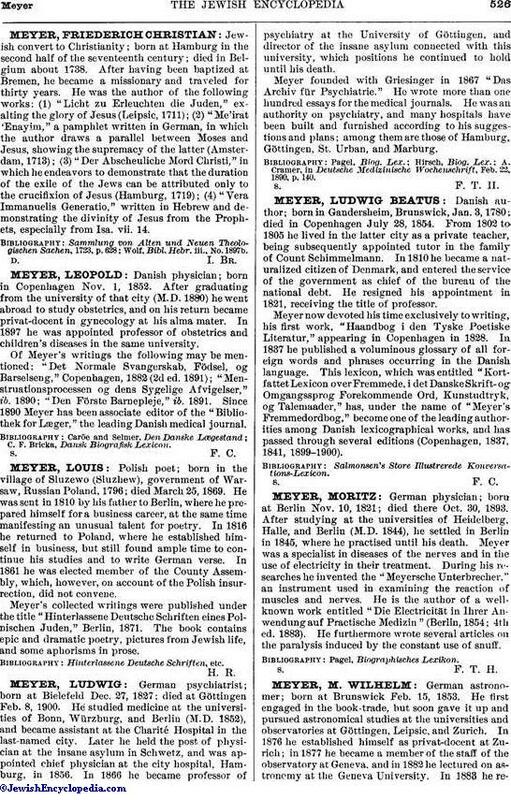 Meyer was a specialist in diseases of the nerves and in the use of electricity in their treatment. During his researches he invented the "Meyersche Unterbrecher," an instrument used in examining the reaction of muscles and nerves. He is the author of a wellknown work entitled "Die Electricität in Ihrer Anwendung auf Practische Medizin" (Berlin, 1854; 4th ed. 1883). He furthermore wrote several articles on the paralysis induced by the constant use of snuff.